The war was coming to an end, France was nearly defeated, and soon the last battle would take place at Epinal. Over the preceding month the Germans had driven deep into France forcing the Allies to evacuate, and then they had hooked south, diving past the Maginot line. Epinal is located behind the line of fortresses, and the Germans were attacking from the wrong way. Their objectives were the small fortresses of Adelphes, Longchamp and Dogneville. Towards this the Germans threw the 6th Panzer Division, supported by a variety of units including the 660th Assault Gun Battery. From this force Kampfgruppe Esebeck, commanded by Colonel Hans-Karl Freiherr von Esebeck was to capture the city of Epinal. The Kampfgruppe had started off the battle of France with one battalion each of tanks, artillery and infantry, along with a company of engineers and anti-tank guns. However by this stage in the campaign the engineers and anti-tank guns had been withdrawn. At least two famous names were also on the force in the 6th Panzer, Claus von Stauffenberg and Franz Bäke. Facing them were a demoralised French formation, which I've not been able to identify. They were described as scruffy and drunk, not interested in defending their ground and all command and control had broken down with the soldiers ignoring the orders of their superiors. However these French forces did obey one order they received, the one to retreat. This didn't leave Epinal open to the Germans though, the 46th GRDI, the reconnaissance battalion for an infantry division took over the defence. Even at full strength this force would only have two 60mm mortars, ten machine guns and a pair of 25mm anti-tank guns. 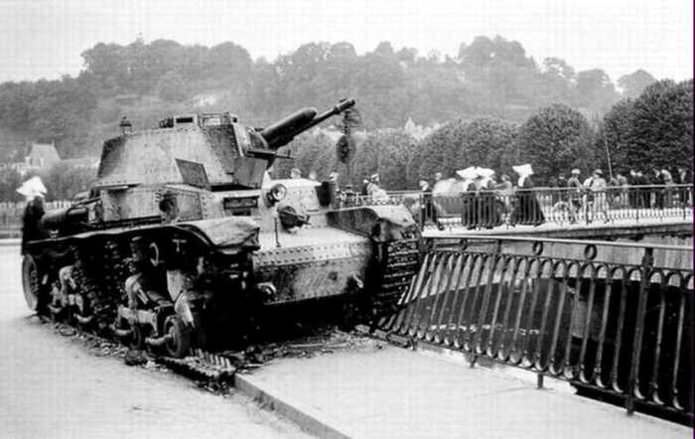 Once again the battle in France revolved around a bridge. The French forces dug themselves in fortifying houses with sandbags and knocking firing slits in walls to cover the buildings flanks, they prepared to fight the Germans aiming to hold them on the river line. The last thing the force did was to lay mines on the bridges, they did this at about 0400 on the 19th of June 1940. 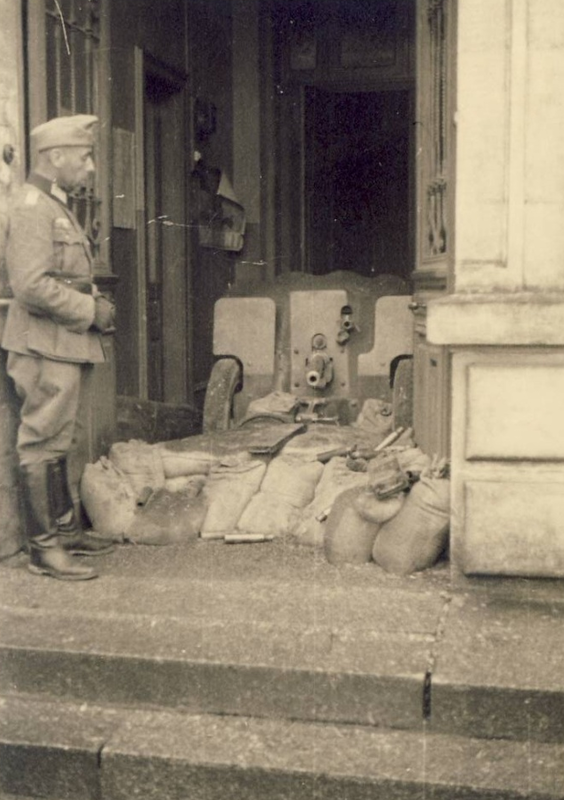 Sgt Schillé's 25mm gun, sandbagged in the entranceway of a school. Looks like some German has nicked the flash suppressor off the barrel. At 0600 the Frenchmen saw several Sdkfz 251's pulling up on the other side of the river, they started to unload the troops they carried within themselves. Immediately the battalion’s machine guns began to stutter, and soon a blazing fire fight was in full flow. The Germans flanked and crossed further down from the French position, luckily there was the open ground of a park there and one of the 25mm's had been sighted to cover it, along with several riflemen. This rush of two half-tracks was wrecked by the French, with both Sdkfz 251's set on fire, although about a squad of Germans was left on the bank, they were under fire from the small arms. The Germans brought up some more armour, a Panzer 35(t). It halted and began to fire at the building occupied across the river, then after only a few shots swung about and drove off, all the time under fire from the 25mm, the rounds bouncing off the tank. About ten minutes later a Panzer 35(t) approached again, no one knows if it was the same one or a second tank, but looking at pictures I suspect it was a second vehicle. It halted beside the river and began to fire against the buildings again. After six or so rounds it lurches forward, crossing the bridge, avoiding the mines laid there. A second 25mm was dug in the doorway of a boys school, it was commanded by Maréchal-des-logis (roughly sergeant rank) Schillé. He waited until the German Panzer was at point blank range, before firing three rapid shots. As was shown earlier the long range striking power of the 25mm was fairly terrible, but at such short range even the 25mm's could hurt a Panzer. The tank shudders to a halt and begins to burn. The horribly burned commander clambers out, and somehow despite the pain helps his loader get out. Of the hull crew one is killed instantly the other, now wounded, manages to get out, despite his wounds he staggers into a house, and ends up in its cellar, he is found there still alive six hours later. 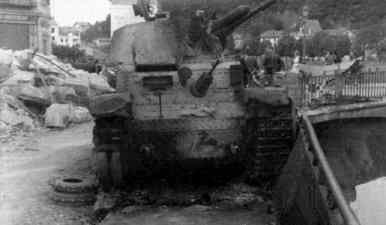 The Ps-35(t) knocked out by Sgt Schillé's 25mm. The blaze on the tank reaches its ammunition, and the tank begins to really burn, this sets fire to the nearby buildings adding to the problems for the beleaguered Frenchman. 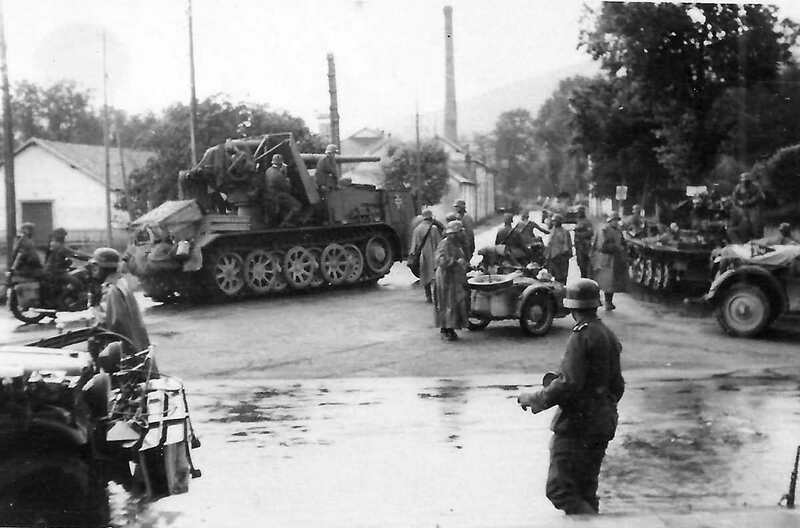 The German bring up some Panzer IV's or maybe Stug IIID's. Their armour would come round the corner, and trying not to close with the 25mm's would then begin to bombard the enemy buildings and then withdraw. One of their salvoes destroyed the 25mm covering the park, and a Panzer IV moves up onto the bridge and begins to smash the buildings. Soon all the French machine guns are destroyed, the last one manned by one volunteer until his stand is ended by the Panzer IV. Unable to respond to the Germans the French troops begin to fall back, leaving a covering screen in their place. These men use up the last of their ammunition and the battle ends. Two days later the war ends for France as the Armistice is signed.